Including the cycle of team mergers, love for some less heralded players, and respect for doing what it takes to get to 10 regular season games. This season, we’re trying something a bit different. Every Friday, our team will look at the exciting stories, teams, players, events, quirks, and all the inbetweens, and highlight five that have them hyped for the weekend of ultimate to come. Check out what’s caught our eye and let us know what you’re looking forward to in the comments. Deep into the college season, the most-read story on Ultiworld this week came from the club division. 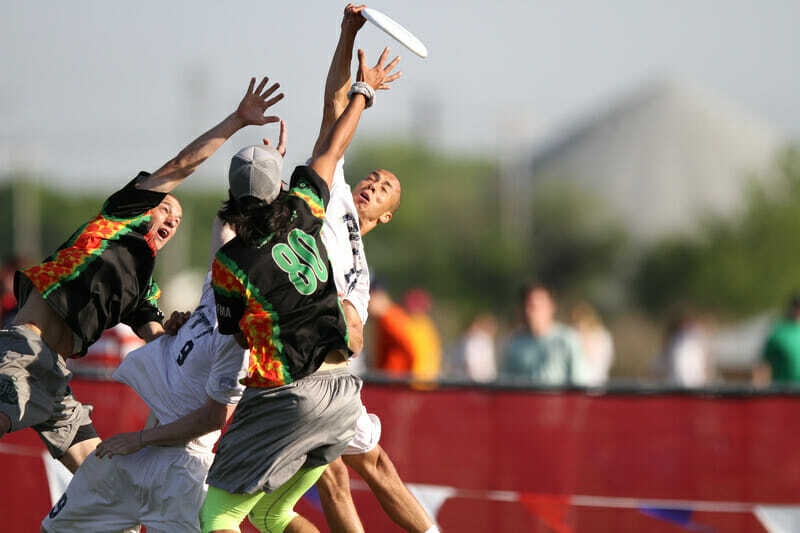 Boston Dig, a two year-old upstart team in the men’s division, is set to absorb Boston Ironside. The latter is just two seasons removed from winning a National Championship. There was some back-patting going on around the Ultiworld virtual offices as the news was confirmed—a number of staff had expected this, including a rather public and prescient prediction from Charlie in a mailbag from less than a year ago. There was also some handwringing about the consolidation of talent at the top. Two more teams throwing in the regional competition towel and focusing on taking down the Bay Area juggernaut, San Francisco Revolver. Boring. This has happened so many times before. It got me thinking about how, as long as ultimate continues to be a player-funded past time, we’re likely bound to this cycle. Elite young talent has long carried our sport forward. Time and again, the best players age out of spending every morning in the gym and three nights a week practicing or at the track. They turn to careers, to families, to other hobbies. Calling ultimate a hobby might sound like an insult and maybe it is to the few elite players who have managed to figure out a sparse, yet effective, lifestyle at the top of the game. But hobby is an accurate descriptor for pretty much everyone else, no matter how obsessed we are with ultimate. We can’t make money from playing, coaching, or organizing it, so we find other things to do, and eventually rotate out. Dig exemplifies the exciting, world-is-our-oyster mentality David Gessner so passionately writes about in his recent memoir Ultimate Glory, another story about two Boston teams that inevitably merged under one banner, three decades ago. It takes that kind of youthful energy to dedicate insane amounts of time to run a team in title contention. Our teens and twenties are a time in life where many of us are lucky to have the privilege to devote so much energy to such an endeavor. Without infrastructure and consistent funding (read: without the establishment of the sport in the country’s athletic fabric), the young upstarts will continue to take over the mantle and force talent mergers as the stalwarts age out and relinquish captainship and control. Sometimes the team names will stay the same, other times they’ll change. Until ultimate changes from a sport we play in our free time to a sport that’s institutionalized and backed by consistent funding that doesn’t go away even when passionate players and coaches do, expect more of the same. After every weekend of ultimate, we have to make choices about who to write about and who not to write about. We cannot cover anyone; nobody wants to read that. My recap of the NW Challenge last week was more than 2,700 words, I didn’t even cover every team who competed, and I guarantee most readers did a little CRTL+F for their team, skimmed the headers, or dipped out after the first paragraph. So I’m going to take this Friday space to highlight a few players whose play style or role on the team doesn’t always warrant headlines or reaction GIFs, but without whom their teams would fall apart. Dzenitis has been a staple in Dartmouth’s lineup for several years, and she was a core player in their tournament win at NW Challenge. She had the most goals at Nationals last year outside of Dartmouth’s “Big 4”, and this season she’s stepped into an even bigger role for Dartmouth’s defense. Petrus plays on the big points, she gets blocks, and she scores goals. She’s not usually at the top of Oregon’s stats leaderboard, but she’s a fast midfielder that Fugue relies on to push their pace. Petrus takes tough matchups for Oregon, and you don’t even realize her matchup is suddenly out of the play. Gianforte plays wherever Stanford needs her, and she plays with relentless consistency and skill. Gianforte typically plays in the backfield, but she truly shines on defense: she made several notable blocks at NW Challenge, and she’s a key piece of Stanford’s excellent zone defense. This girl is so fast. I’ve watched her outrun her defender again and again for the Thunderbirds. Leong doesn’t always launch the big, jaw-dropping hucks of some of her counterparts, but she’s been a part of their handler core for a long time, and her reset cuts are some of the fastest in the divison. Seriously, try to stop this girl. We’ve mentioned several times how Bryant Craze struggles every year to get their 10 sanctioned games in. Inevitably they have a tournament canceled by weather, fall short of playing enough games to earn a bid to Nationals for their region, and end up taking a bid earned by someone else. This year’s Bryant team was determined to break that mold. They scheduled three regular season tournaments, thinking that surely at least two would be played so they could earn a bid this year. Even Mother Nature wouldn’t be so cruel as to impede their ten games with that kind of preparation, right? Wrong. Craze’s first two tournaments were canceled, leaving just New England Open this weekend on their schedule. It would have been understandable for Bryant to throw their hands up and accept another year of single digit regular season games played. Instead, they were able to pull together a round robin last night on their campus, hosting Keene State and University of Rhode Island in order to get three games in. Now, with the typical seven games needed this weekend at New England Open in order to reach the required games threshold, Bryant can focus on earning the bid on the field rather than worrying about logistics. Their three games last night were all blowouts that will be ignored in their final ranking, so all that matters at this point is how they perform this weekend. A tip of the cap to them for putting in the work to get to 10 games; I’ll be watching to see how those games unfold. Three things you can expect when you’re in Myrtle Beach: southeastern retirees playing mini golf, beautiful weather alongside the beaches of the Atlantic ocean, and Pitt vs. UNC-Wilmington. I’ve been covering college tournaments since 2013, and was there a year later when Wilmington upset Pitt behind sophomore standout Jack Williams and Brian Casey danced across the field. I knew in the aftermath of that matchup that there was a special brew between these two teams, but what I didn’t yet understand was the inevitably of their playing each other every time they were in the same state. It doesn’t matter what sort of season the two clubs are having, it’s always compelling. It will be tomorrow, and it will be in 25 years when Jack Williams Jr. is matching up against somebody with the last name Thorne. Wilmington can stay undefeated with their best win of the season or Pitt can prove their destined for yet another Nationals run. Tune in to the Ultiworld stream at 1:00 p.m. tomorrow to witness another chapter in an ongoing saga. The ride from Atlanta to Myrtle Beach for Easterns takes a few hours…and the driver, who will remain unnamed for the purposes of this story, may have driven in the wrong direction for 45 minutes, giving us some extra time. After the smashing success of our Disney Princess Draft, Preston Thompson, Daniel Prentice, and I took on a 64 animated film Disney Bracket on our drive up. You may have seen the smaller, unseeded, inferior bracket floating around, but we went big. It actually inspired some pretty tense arguments. When two of us selected The Goofy Movie over Snow White, the third person spiraled into a front seat fury. Cinderella vs. Toy Story 2 and The Incredibles vs. Mulan sparked particularly fierce debates. Hercules made a miraculous run through Fantasia and Finding Nemo to reach the Elite Eight. Our Final Four, however, is mostly pretty straightforward: Aladdin, The Lion King, Toy Story, and Toy Story 3 (to us, the clear weakest of the semifinalists). It was a landslide victory for The Lion King, a total package film that is perfectly in line with our age group. The heavy favorite made for a chalky ending, but the journey was memorable and worthwhile. These sorts of silly and organic activities are part of what make the experience of being on a team so fun. Team Ultiworld may not win a lot of games each year, but we always make Nationals. And we have fun along the way, recapturing a bit of the joy between points that makes working together worth it. Comments on "The Friday Five: Role Players, Team Mergers, and Disney Bracket"